The saga continues… My cats are still dealing with some mysterious health condition that causes Rumi & Andy to itch excessively. Emma’s symptoms were different at first and I think the initial problem was taken care of but she then began itching, too. Emma seemed to be cured following the first lime sulfur dip. Andy has gotten better after each of the 3 lime sulfur dips. Rumi is still itching much more than the others, despite all we’ve tried. The poor fella doesn’t even sleep because as soon as he sits still, he has to jump up to lick, scratch, or bite himself again. Andy after a recent lime sulfur dip at the vet. 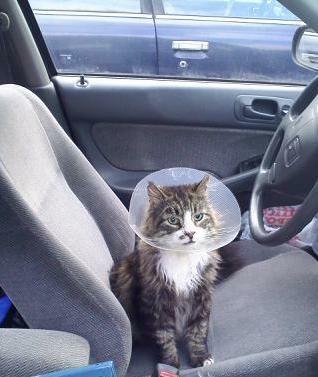 I don’t know how he managed to get out of the carrier with this stiff e-collar on! acupressure & massage to relieve anxiety & stress from these trips to the vet & topical treatments! This week I’m going to try a flower essence tincture custom blended for my cats with this specific issue. I’m also going to try colloidal silver. I hesitate to try more than 1 thing at a time because if they get better, we won’t know which is helping. But I’m desperate to give Rumi some relief. Poor little guy. The tincture was blended by the second natural health practitioner we’ve worked with in addition to their usual vet & another vet at Hawks Prairie Vet Hospital. I’ll also make an appointment with a veterinary dermatologist soon. They can review the test results we’ve got so far and (cringe) I suspect they’ll want us to do more tests. Meanwhile, Rumi looks at me suspiciously when I walk towards him cuz he’s so afraid I’m going to put something cold & wet on his bare belly, legs, and back. And I continue to cry when I see how miserable he is. Eldredge, Delbert G. M., Liisa D. Carlson, James M. Carlson, M Debra. Cat owner’s home veterinary handbook. Indianapolis: Wiley Pub, 2007. Frazier, Anitra and Norma Eckroate. The Natural cat. New York: Plume, 2008. Wulff-Tilford, M.L. and G. L. Tilford. All You Ever Wanted to Know About Herbs for Pets. Irvine, CA: BowTie Press, 1999.